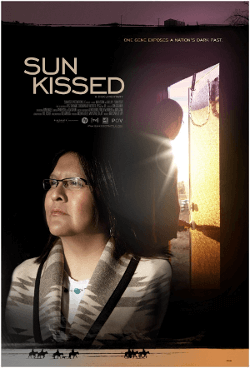 Sun Kissed is a beautiful touching film about a Navajo couple who discover their kids suffer from an affliction that makes the sun deadly to them. This genetic disease is rare, but they also learn that it’s nowhere near as rare as it should be in their community. The story takes us on their voyage of discovery to learn why, and what could be the real story behind so many cases of this skin disease. Dorey and Yolanda Nez lost their son to XP – a very rare genetic disorder that causes extreme skin sensitivity to sunlight. They come to learn their daughter Leanndra also suffers from the same problem. Dorey cares for his daughter. Yolanda works for Native Americans as an advocate for those with disabilities. Through her work she comes across more and more Navajos who also know of children that suffer with XP. They follow the trail, and are shocked to discover that a genetic disorder that is normally a 1-in-a-million chance in the US and Europe, afflicts an incredible 1-in-30,000 on the Navajo reservation where they live. XP, or xeroderma pigmentosum, is a very unusual inherited condition causing extreme sensitivity to the suns rays (ultraviolet light). It greatly affects the eyes, as well as any area of skin that could be exposed to the sun. Signs are usually visible in affected children from a very early age, with some showing extreme sunburn from even a couple of minutes of sun exposure. This can cause soreness and blisters for weeks after exposure. Other signs are very dry skin (which is where the name ‘xeroderma’ comes from – xero meaning dry, and derma meaning skin). This extreme sensitivity ultimately results in skin cancers from even minor exposure to sunlight. Without protection about half of those affected will tragically get their first skin cancer before the age of 10. Most sufferers will develop multiple cancers through their lifetimes. Less than 40% of those with XP tend to live beyond age 20, although those with less severe cases can and do live into their 40’s. You may have come across XP even if you do not know anyone who personally suffers with the condition. Brad Pitt actually played a character with XP in The Dark Side of the Sun (1988). Dean Koontz also wrote a very entertaining series of books (the Moonlight Bay Trilogy) where the main character, called Christopher Snow, suffers from XP. It’s very much a central theme to the books.